i’ve been trying to get some of my bad habits under control. the one i’ve been focussing on is my habit of eating random bars of chocolate at work, to satisfy a sugar craving. something a bit healthier to assuage my guilt was the order of the day and these river cottage honey & peanut butter booster bars were just perfect. i’ve really been enjoying hugh fearnley’s whittingstall’s latest tv series – river cottage every day. it has been running head-to-head with a truly dismal self-parodying (i hope!) nigella lawson series which has featured some of the worst recipes i’ve seen on tv for a long time. by contrast hugh’s been thoughtfully finding ways to encourage all to make the effort to cook and eat healthy food on a daily basis. these flapjacks (booster bar sounds ridiculous, sorry hugh!) were part of an episode about breakfasts and are delicious. they are much healthier than the flapjacks i grew up with – the butter and golden syrup is replaced with a reduced amount of butter, peanut butter (i used crunchy) and honey. 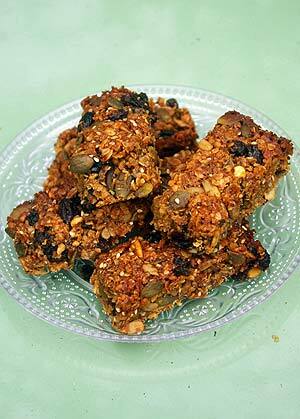 i used dried blueberries and raisins to add a fruity sweetness plus a mix of pumpkin, sesame, poppy and sunflower seeds. hugh says that the peanut butter can be substituted with mashed banana – i think i’ll try this next so that i can feel even more virtuous as i tuck into my mid-morning flapjack. grease and line a baking tin, about 20cm square. put the butter, sugar, peanut butter, honey and grated citrus zests in a deep saucepan over a very low heat. leave until melted, stirring from time to time. stir the oats, dried fruit and three-quarters of the seeds into the melted butter mixture until thoroughly combined. spread the mixture out evenly in the baking tin, smoothing the top as you go. scatter the remaining seeds over the surface and trickle with a little more honey. place in an oven preheated to 160°c/gas mark 3 and bake for about 30 minutes, until golden in the centre and golden brown at the edges. leave to cool completely in the tin (be patient - it cuts much better when cold), then turn out and cut into squares with a sharp knife. these bars will keep for 5-7 days in an airtight tin. variation: banana booster bars: replace the peanut butter with 1 medium ripe banana (about 175g), mashed. stir it in after all the other ingredients have been combined. update: i think this variation is horrid; it also reduces the life of the flapjacks.